Kevin proposes to Robin, but will he take it back when Robin tells him she can't have children? Meanwhile, Barney and Ted try to score on the "drunk train" to Long Island, but something is surprisingly holding Barney back. Ted Mosby: Last week I went out with a girl whose favorite band was Glee! Whilst this episode is a step up in quality from the previous one, I'm disappointed to see them that the show seems to be going backwards in relation to certain characters. Plot In A Paragraph: Kevin and Robin join Marshall and Lily on a romantic weekend break, where Kevin proposes to Robin, but Robin feels she can't say yes, until she tells him she can't have children. 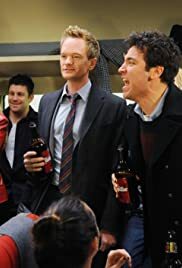 Meanwhile, Barney and Ted find the easiest way to score girls, after Lily and Marshall tell them about the "drunk train" to Long Island, but Barney is not his usual self. I said in my review of the last episode, that the show may have ran out of ideas, and the episode ending with Ted telling Robin he loved her, is like the show going back to season one and repeating itself. If Robin was to get back with an ex, I'd rather it was Barney, as I found them to be a much better couple, and with Robin still having feelings for him earlier in the season, I thought that's how it would pan out. I said a review a few episodes back, that I don't care what he said, Ted was clearly still in love with Robin, and the end of this episode proves it. Ted always talks about "the one" and "the mother of his children" and he is willing to give up his dream of kids to be with Robin. A major plus point of this episode is that it looks like Kal Penn has ended his disastrous spell on the show.